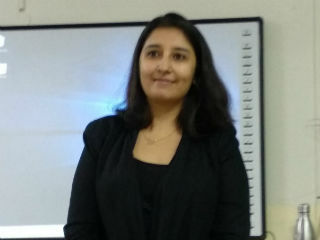 PGDM Department organised a guest lecture on "How to Communicate effectively" for PGDM Batch (2018-20) Sec C Students by Ms. Neha Sethi, Founder and Director at Impart on 25th October, 2018. Students were asked to express their views on "language" as why and how to communicate? Many real life fun experiences, anecdotes, role plays were used to brief the students and the do's and don’t s for an effective communication were shared. Speaker conducted various activities by engaging student and made them to react in different situations in order to understand the role of paralanguage, body language while responding. Likewise intonation, pitch, facial expressions, body language, speed of speaking were the wide gamut of sub topics covered. For understanding the power of listening students were asked to sit in silence for a minute and hear even the slightest of noises which could include the sound of the fan, the rustling sound of the foot or even the sound of breathing. She advised the students to inculcate the activity in their daily routine as it will enhance the listening skills as well. Overall the session helped in developing effectiveness in communication. 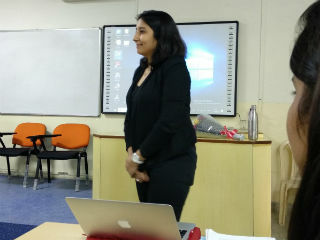 Students look forward to such sessions with the speaker as they liked the style of inculcating ideas in their personality which will help them in becoming articulate managers in future.